I made pulled pork sandwiches for my sister’s lunch club at work and people loved it. One of her friends even started making this on a regular basis at home. A year later, they invited me to a party where they served this as the main 🙂 (Ed and my brother love this recipe too.) The homemade BBQ sauce is great and could be used as a condiment or with other recipes. This also happens to be my favourite slow cooker recipe. I served the pulled pork on fresh kaiser buns with a side of coleslaw (recipe here) and pickles. In a bowl, whisk together all of the ingredients for the BBQ sauce. Adjust seasonings to taste (i.e. heat, sweet, sour and salt) and set aside. Spread out the sliced onion over the bottom of your slow cooker. Place the pork shoulder on top of the onions in the slow cooker. Pour half of the BBQ sauce over the pork, cover the slow cooker with its lid, and cook the pork over low heat until the meat is fall-off-the-bone tender, about 7 1/2 to 8 hours. Reserve the remaining sauce. Remove the pork to a large bowl, turn the slow cooker onto high heat, and use two forks to pull the meat apart and into shreds. 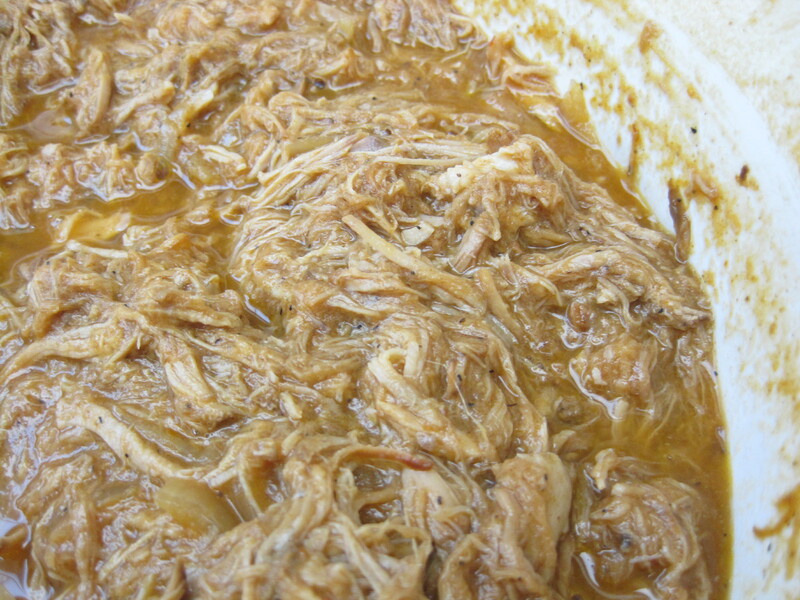 Discard any bones and transfer the meat back into the slow cooker with its juices. Add the rest of the BBQ sauce and mix the meat well. Cook for another minute or two to allow the meat to soak up some of the liquid. 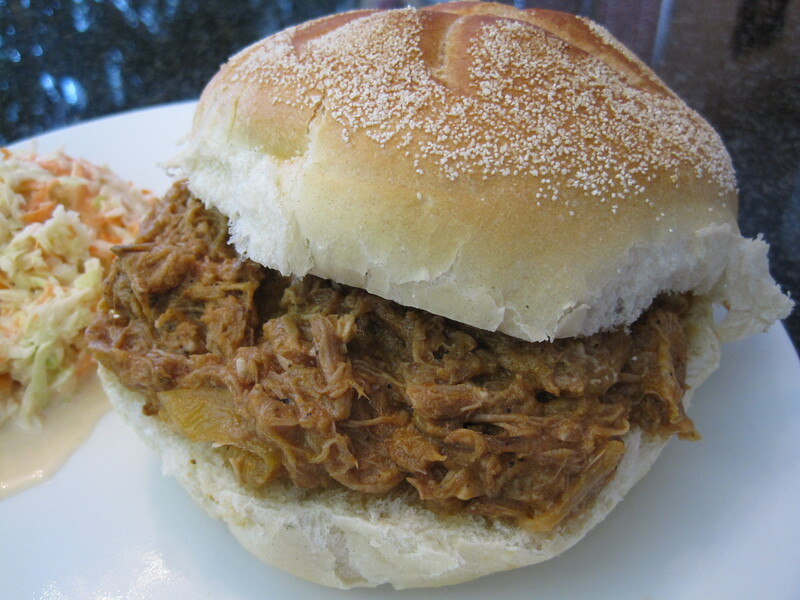 Turn the slow cooker off and serve the pulled pork on soft buns. Your pulled pork sounds like it was very good. A slow cooker really works with pork. Hi Karen, Thanks so much for your comment. I agree! I just started experimenting with slow cooker recipes and so far the most successful ones have been for pork. It only indicates that “adjust seasonings to taste (i.e. heat, sweet and sour)”, no salt in the ingredients. Is it a typo that the salt is left out? Thank you for pointing that out! I deliberately left salt out of the recipe because it was flavourful enough for my taste without added sodium. But I have revised the ‘adjust seasonings’ instruction to include salt in case other people prefer this saltier. Thanks again! I made this recently for a group of ppl and it was so yummy! I used about 4lbs of pork shoulder (as that’s all my slow cooker could fit) and it really absorbed the flavour on the high heat. Great recipes + definitely looking here again for the next party. Thanks Ali! Wow, wonderful weblog format! How lengthy have you been blogging for? you make running a blog look easy. The whole look of your web site is fantastic, as smartly as the content!